Before I arrived in Kazakhstan I was intensively involved in volunteering in my home city in Finland. I worked for various volunteer projects and, at the same time, I learned a number of useful skills to promote volunteerism. One of the most enriching experiences of my time in Kazakhstan has been the possibility to use those skills. UN Volunteer, Toni Paju (letft) engaged in discussion on volunteer efforts in environmental activities, with the Governor (centre), CSO leaders and youth volunteers. 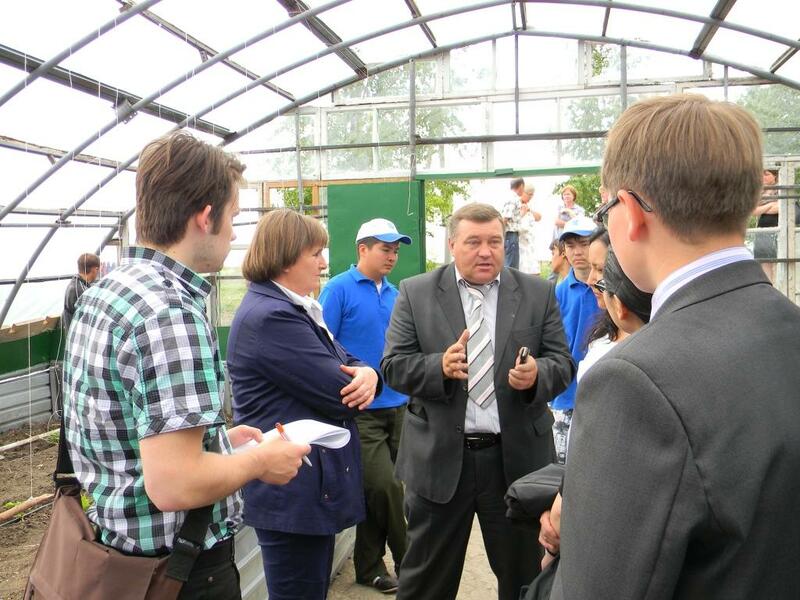 The photo was taken inside a greenhouse with drip irrigation system, supported by UNDP. (UNV programme, 2012). Astana, Kazakhstan: The only things I knew about Kazakhstan were from a comedy film, and also that it was a huge country. This was before that evening when I opened my email to discover an offer for a United Nations Volunteers (UNV) programme’s assignment at the United Nations Development Programme (UNDP) Kazakhstan. After that, I hastily looked for information on it, and that’s when I found that Kazakhstan is the ninth largest country in the world, located in Central Asia, that it is a higher middle income country on its way to becoming a net donor of development aid, and also that it faces development challenges similar to most middle income countries. I came to Kazakhstan to work as a volunteer advisor on poverty and environment. My tasks included advising the country office on how to integrate local development and environment into their projects in a more efficient manner. The work involved interacting with numerous people from the office, coordinating cooperation between the units and promoting volunteerism in Kazakhstan. Before I arrived there, I was intensively involved in volunteering in my home city in Finland. I worked for various volunteer projects and, at the same time, I learned a number of useful skills to promote volunteerism. One of the most enriching experiences of my time in Kazakhstan has been the possibility to use those skills, since there is a huge potential for coordinating volunteerism for development in the country. It has been an extremely motivating experience to meet a large number of people of all ages, and from different backgrounds, all with the same enthusiastic look in their faces when they talk about their own volunteer efforts to advance development in their own communities. I can say that central Asian culture and people are very welcoming and warm. Maybe it is because of the great variety of different ethnicities that live side by side in Kazakhstan, but it has been extremely easy for me to blend in and make real meaningful ties of friendship with the local people. The time in Kazakhstan has made me see the potential of volunteerism for making a difference. Now with the perspective of time, I can say that despite the very challenging task, I have been able to make a difference and, during the process, I have grown significantly both professionally and personally. I met a lot of professionals who taught me a great deal, and a number of great friends who I will surely stay in touch with. Bio: Toni Paju is a Finnish international UN Volunteer who served as Advisor on Poverty and Environment in UNDP Kazakhstan from August 2011 to August 2012.